As a Quick-Service Restaurant in a highly competitive industry, you know that margins are thin, and you will need as many creative, new ways to lower costs and increase sales as possible. We’ve come up with 5 of the best ways any Quick-Service Restaurant can quickly lower costs, increase sales, and ultimately, become more profitable. In our current economic climate, every penny counts, and Quick-Service Restaurant franchises must be vigilant to cut down on rising costs and unnecessary waste wherever they occur. The three main cost categories (Prime Costs) are food, beverages, and labor. Supplier Cost Increases: Whether it’s due to seasonal price fluctuations or general inflation, quick-service franchises should know what price variance to expect. When cost increases fall outside this variance, alternative ingredients or vendors should be considered. Over-Portioning: Whether it’s due to insufficient training, inattentiveness, or poor kitchen utensils, over-portioning is generally a very easy problem to solve. If you observe kitchen staff over-portioning, individual training sessions are typically the quick, easy fix. Food Waste: Food waste, like over-portioning, is usually caused by insufficient training, inexperience, or inattentiveness. Food waste is also easily remedied by observing kitchen operations. Another easy way to identify food waste is to simply examine the contents of the dumpster. Typical things to look for are signs of poor food preparation that waste large portions of usable ingredients, and excessive amounts of spoiled food being thrown out. Most of these costs can be reduced with better food preparation training and better inventory management. Pre-packaged, processed foods are another potential solution to consider, as they provide very low waste, a significant reduction in labor, and a consistent end-product. Shrinkage: Extra shift meals by employees, theft, and lost product all contribute to shrinkage costs. It’s important to measure shrinkage, and take necessary steps to prevent it whenever possible. Scheduling: Over-staffing is just as problematic for Quick-Service Restaurants as under-staffing when it comes to bottom-line profitability. In order to avoid the problems that arise from both of these scenarios, many Quick-Service Restaurants employ staffing software that predicts, with a high degree of accuracy, exactly how many staff members are needed at all times. Staff Turnover: The cost of running employment ads, time needed to conduct interviews, and time needed to complete administrative tasks associated with hiring staff all underline the importance of keeping employee morale high to minimize turnover. Wages, schedule flexibility, and benefits are all major sources of staff turnover that should be examined. “Would you like fries with that?” is a question all of us have heard at least once, and for good reason. If you aren’t suggesting additional items to customers during the ordering process, you’re simply leaving money on the table. Upselling to existing customers is far cheaper and easier than acquiring new customers. In addition, you can rapidly and dramatically increase a customer’s lifetime value if a successful upsell permanently changes their buying habits into the future. For example, customers who are successfully upsold from ordering a Medium-sized beverage to a Large-sized beverage, who then make that their new, permanent buying habit, will substantially increase your revenue and profits over the long-term. Instead of asking if they’d like a drink, suggest adding an ice-cold Coke or Sprite to their order. If they order just an entree, suggest making it part of a Large-sized combo meal for a few dollars more. By making specific, helpful suggestions, the customer feels taken care of, rather than taken advantage of. Customer satisfaction is an important metric to measure and work to increase for many reasons. When customers are satisfied, they come back and purchase again, they are more open to upsells, more likely to forgive mistakes, more likely to try new product offerings, and more likely to tell their friends about you. Quality of Service: Friendly, attentive service puts customers in a good mood, which increases loyalty, repeat purchases, and receptivity to upsells. Speed: Quick service not only boosts customer satisfaction, but it also increases the volume of customers you’re able to serve, which ultimately increases revenue and profits. Rewards for Loyalty: Loyalty programs are a great strategy for making customers feel appreciated, and for increasing customer retention and repeat purchases. Some studies have shown that a loyalty program can increase sales by up to 20%. One of the worst things a Quick-Service Restaurant owner or manager can see when they look out over their dining area are empty seats. Those empty seats mean even thinner margins in the short-term, which can cause major issues in the long-term. For many QSRs, filling those seats up during slow, off-peak hours or days of the week is a high-priority problem to solve. The key is to either entice existing customers to visit again at a different time of day, come in an additional day of the week, or to entice a whole new group of customers to visit. Offer coupons to guests that can only be redeemed during slow hours or days of the week. Offer menu items that are available only during slow hours or days of the week. Offer special promotions during slow hours or days of the week. Examples include Taco Tuesdays, Early Bird specials, Happy Hours, and Late-Night specials. Offer lighter, snack-sized menu items that customers can consume in-between normal meal times. 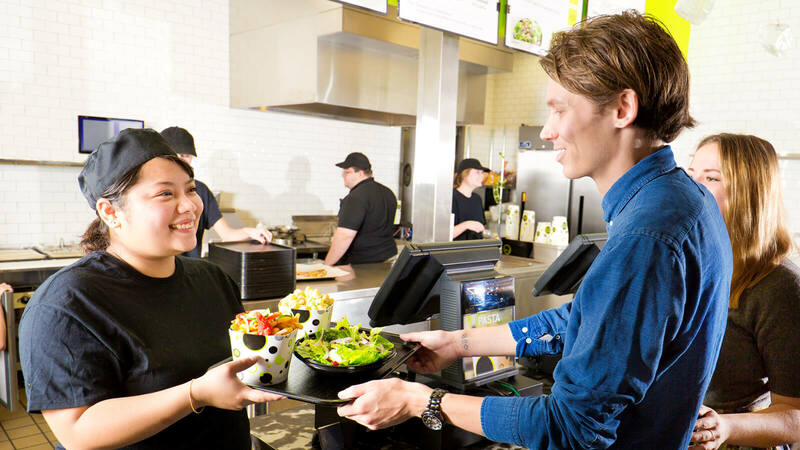 Expanding menu offerings is one of the best ways for QSRs to quickly increase revenue, but finding profitable menu items that customers love can be challenging. 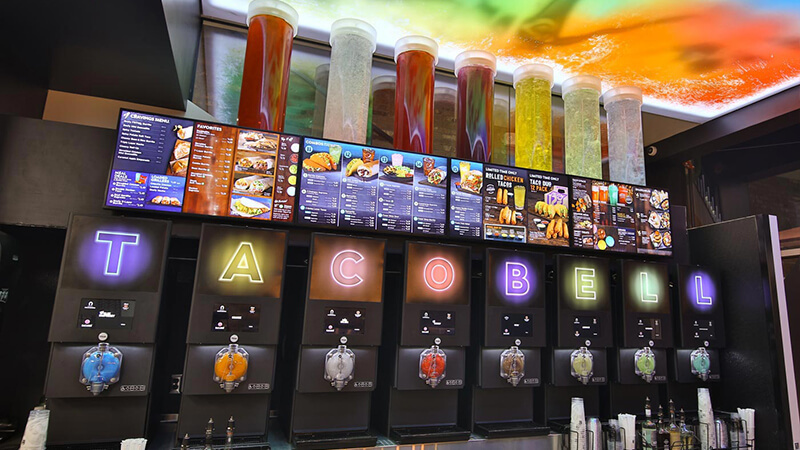 To fill this need, more and more Quick-Service Restaurants are turning to frozen beverages because of fast-growing demand, high profit margins, small footprint, and low maintenance. According to Technomic’s 2016 Beverage Study, 51% percent of consumers ordered a frozen beverage and 30% of consumers said they are purchasing frozen drinks now more than they were two years ago. Commercial frozen drink dispensers require minimal ingredients and have the potential to create a highly profitable product offering. 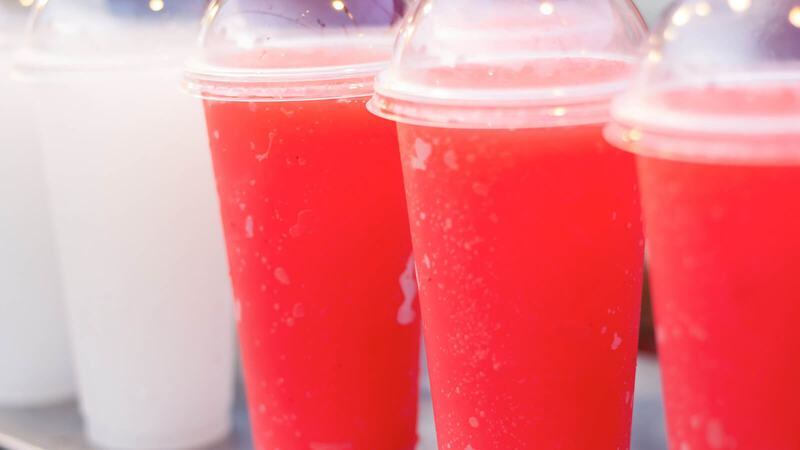 Slush and granita drinks are primarily comprised of water, cutting costs on more expensive ingredients, such as dairy products. Frozen carbonated drinks provide even higher profits, given that 50% of a poured drink is CO₂ (air) and 40% is water. The margins are potentially 20% higher than fountain drinks. 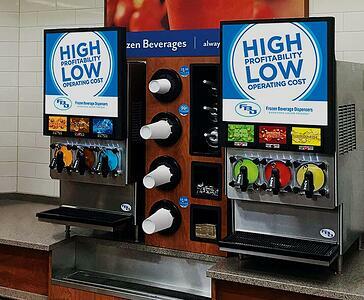 The simple ingredients that go into preparing frozen beverages allow QSRs to achieve gross profits of up to 80%. Take advantage of this opportunity to help consumers quench their thirst with these enticing frozen concoctions, and increase your location’s foot traffic by offering consumers beverages that provide a memorable experience.